COLUMBUS, OH—The Ohio Ecological Food and Farm Association (OEFFA) has named the 2018 recipients for the Stewardship and Service awards. 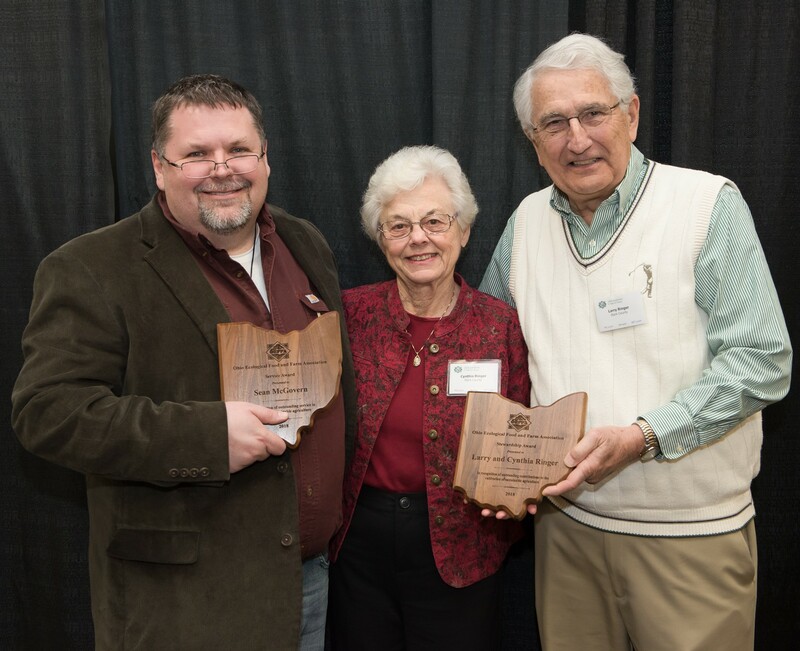 Larry and Cynthia Ringer of Stark County received the Stewardship Award, which recognizes outstanding contributions to the sustainable agriculture community, and Sean McGovern of Franklin County received the Service Award, which recognizes extraordinary service in support of sustainable agriculture. The announcements were made on Saturday, February 17 in Dayton as part of OEFFA’s 39th annual conference, A Taste for Change. Larry and Cynthia Ringer founded Ohio Earth Food in 1972 with Cynthia’s family, in the midst of the chemical agriculture boom. At the time, they were working on the vegetable farm of Cynthia’s dad and early organic farmer, Glenn Graber. After observing the benefits of kelp and concerned about the effects of conventional farming on the environment and human health, they realized there could be an emergent market for organic fertilizers, and started selling kelp products and rock phosphate. They have been active in OEFFA since its beginning. Larry served seven years on the OEFFA certification committee and has taught conference workshops, and Ohio Earth Food has been a fixture at every OEFFA conference trade show for nearly 40 years. “In many ways, Larry, Cynthia, and Ohio Earth Food helped support a quickly evolving organic movement in Ohio, at a time that farmers were first beginning to look for alternatives to chemical fertilizers and pesticides,” said OEFFA Executive Director Carol Goland. Sean McGovern has been the National Outreach Manager at the Sustainable Agriculture Research and Education (SARE) program since 2004. There, he helps to educate farmers and agricultural professionals about the results of SARE-funded farmer-led research projects; develop educational partnerships between organizations, educators, and producers; evaluate the impact of programs, and develop and improve SARE communications and database tools. Sean has worked at OEFFA since 1994, continuing as an OEFFA employee in his capacity with SARE. He was first hired by OEFFA as a part-time secretary, about a year after graduating from Ohio State University. As OEFFA grew, Sean’s title shifted to Executive Administrator and eventually to Executive Director. He worked to develop productive partnerships with Ohio State University Extension and advocated for the creation of a new Organic Food and Farming Education and Research (OFFER) program, leading to the first organic production research at OSU. He focused on providing affordable educational programs that OEFFA’s members wanted, growing the membership base, and putting administrative systems in place that facilitated future growth. “I will tell you that I am blessed to have learned so much from the OEFFA family,” Sean said. “What an opportunity it was for a young, impressionable young man like myself to be invited into a community of people wrestling with the practical issues of building a more sustainable world. I will forever be thankful to all of the OEFFA members who are living proof that leading a kind and mindful life is a choice, not a pipe-dream.” He received a standing ovation from the audience following his remarks. “We at OEFFA are grateful to Sean McGovern for his nearly 25 years of service to OEFFA and to the sustainable agriculture community. His early leadership was instrumental to OEFFA and to the development of today’s local food movement in Ohio,” said Goland. 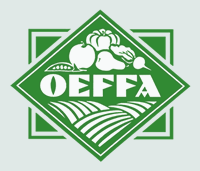 The Ohio Ecological Food and Farm Association (OEFFA) is a statewide, grassroots, nonprofit organization founded in 1979 by farmers, gardeners, and conscientious eaters working together to create and promote a sustainable and healthful food and farming system. For more information, go to www.oeffa.org. For photos of the award recipients, contact Lauren Ketcham at (614) 947-1643 or lauren@oeffa.org. Please provide photo credit to Ed Chen.